Since I learned that April was National Poetry Month, I’ve been thinking about how I can best observe. Poetry has always been important to me. In high school, I channeled a lot of frustration and heartache into the margins of my 5-Star notebooks. After school, I’d spend hours shaping my scattered marginalia into poems and, if I thought they were any good, I’d call my friend who lived in the next town over (also a high school poet) and read them into the receiver of my land line and then eagerly await his reaction. In college I was beyond excited to learn there was a legit, for-credit creative writing class that focused solely on poetry. That’s where I learned that even though poetry is often personally meaningful, it’s not too precious or sacred to be edited, revised, rewritten or even scrapped all together. For a writer, there is probably no more important lesson. You have to be open to editing and revisions and deleting if you want to create the best possible product. College is also where I learned that other people (besides my one other literary friend back home) thought poetry was important, too. In high school, I was the only one who wouldn’t groan when a Lit teacher announced that we were starting a poetry unit. In that poetry writing class, I found a whole posse of people who also spent their free time dissecting the meaning of song lyrics and scribbling lines between classes. Today I don’t write nearly as much poetry as I did in high school or college, but it’s still important to me. In fact, poetry plays a crucial role in my YA novel. Much like I did, the main character works through a lot of her issues with her own poetry. She keeps a private blog, the entries of which are interspersed between chapters. I’m sure if blogs had existed when I was in high school (nearly 15 years ago!) I would have had one, too. And my friend would have been giving me feedback in the comment section rather than sharing them over the phone. 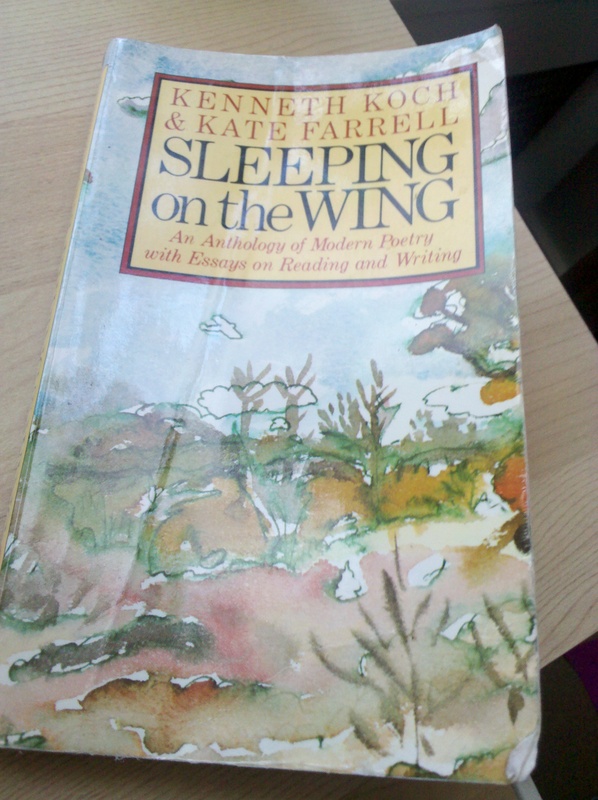 I actually dug out the poetry anthology we used in that creative writing class in college. I flipped through and read a few poems here and there. It’s actually a diverse and powerful little book. I’ll always stop on William Carlos Williams’s famous This is Just to Say. Now that I am married, this poem means even more to me. Except instead of cold plums, it’s more like the last half of that Ben and Jerry’s Pistachio Pistachio. But, even before high school or college, long before I knew of Williams or Dickinson or Whitman, I fell in love with silly brilliance of Shel Silverstein. Like a lot of kids, my first book of poetry was “Where the Sidewalk Ends.” I LOVED this book. I still have a copy kicking around, though I’m not sure if it’s mine or my husband’s from childhood. I remember in fourth grade art class when our teacher had us illustrate a randomly selected poem from WTSE. I stood up and excitedly recited “Sick” from memory before she began distributing the little slips of paper. I got some weird looks from my classmates. But it all worked out because, when she passed my work station she took a moment to flip through the stack before handing me my assignment. I beamed with pride and happily got to work drawing my version of little Peggy Ann McKay. Question: Is poetry an important part of your life? What’s your favorite poem? So my favorite poem (the one that I’ve been able to recite at various points of my life) is William Ernest Henley’s “Invictus”: http://www.wussu.com/poems/wehootn.htm. I love the “down but not beaten” stance. The resilience is inspiring. And the idea (hope?) that one has that level of agency in one’s own fate… well, it’s empowering. Thanks for the idea to revisit my favorite poem! Oh, this is a good one. Poetry.org also suggested that you “keep a poem in your pocket” to celebrate NPM. I could see how carrying this one could be empowering.